The world is moving fast but the need for energy and fuels is one of the common threads throughout the course of history which is related to almost everything that human does or wishes to do. Energy, in its many useful forms, is a basic element that influences and limits our standard of living and technological progress. Energy is the capacity to make something happen. Without energy, life would cease to exist. Energy is the support system for all of us. It is used to cook food, make humans, animals and plants live and grow, power buildings; in fact, every machine on the planet including vehicles, televisions, computers, machineries, and power plants run on energy. Even the plants that make such machineries run on energy. Achieving a sustainable energy future depends on renewable energy sources. Fossil fuels, which supply about 80 percent of the world’s energy, are believed to be depleting soon at their present rate of consumption. Biomass is projected to be a growing part of future sustainable energy sources. Biomass is the most commonly used renewable energy source in the United States. It is a naturally occurring, widely dispersed carbon resource and a logical choice of raw material for the production of a broad range of fossil fuel substitutes. Biofuels, on the other hand, are energy sources derived from biological materials, which separates them from other non-fossil fuel energy sources such as wind and wave energy. Both the terms are sometime used interchangeably, but they differ in context. Biomass is defined as all plants and plants-derived materials including feedstock such as vegetable oils, forestry residues, wastes from pulp and paper mills, urban wood wastes, animal manure, plants, grains, and animal-based oils. Forests and agricultural lands are the two largest potential biomass sources. Biomass is all non-fossil organic materials that have an intrinsic chemical energy content. All energy-containing forms of carbon and all land and water-based vegetation are referred to as biomass. Biomass is inexpensive, widely available and has fewer environmental concerns than fossil fuels. Woodchips, sawdust, animal dung, food scraps, and sewage are also used for biomass. The energy released from biomass is called bioenergy, which is further used for cooking, heating, lighting, and producing electricity. Biofuels are energy sources derived from biological materials. They can be solid, liquid, or gas and all three forms of energy are sustainable and renewable because they are produced from plants and animals. ORNL defines biofuels as, “Fuels made from biomass resources, or their processing and conversion derivatives.” More than half of the fossil fuels people uses are burned in vehicles and to reduce the usage of fossil fuels, companies have started manufacturing vehicles that run on biofuels. Many biofuels are used in place of gasoline and diesel to run current technology. Unlike fossil fuels, biofuels are renewable energy sources that could last indefinitely. There are five main types of biofuel: methanol, biodiesel, butanol, ethanol, and bio-oil. 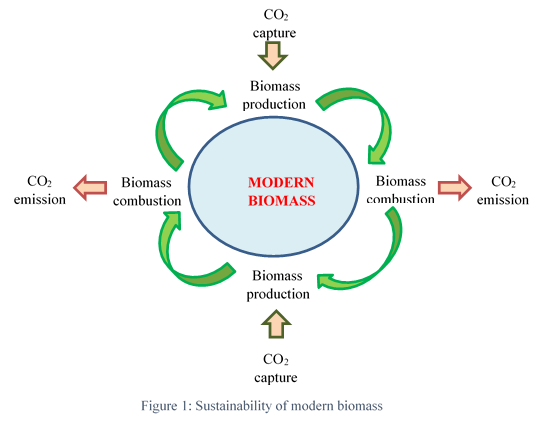 Biomass is all non-fossil organic materials that have intrinsic chemical energy content. All energy-containing forms of carbon and all land and water-based vegetation are referred to as biomass. The term biomass refers to organic matter that comes from plants and animals and it is a renewable energy source. Biofuels, on the other hand, are energy sources derived from biological materials through contemporary biological processes. Biofuel refers to any fuel derived from biomass, that is, animal wastes or plant or algae. It also refers to liquid fuels such as ethanol and biodiesel that is a fuel made from oils of plants. Biomass is a renewable energy source derived from all plants and plant-derived materials, including forestry residues, pulp and paper mills waste, animal manure, urban wood waste and so on. Forests and agricultural lands are the two largest potential sources of biomass. In fact, all the wasted plant materials, paper waste, garbage are the sources of biomass. Biofuels can be biogas or bioethanol or biodiesel. Ethanol is derived from sugarcane and corn; biodiesel is obtained from soy, animal fats and vegetable oils. Biomass can be converted directly into liquid fuels – biofuels – for basic transportation needs. Another biofuel derivative methanol is made from natural gas. Solid biofuels, principally biomass, have been and is still used to provide heat and for cooking, and is currently used in abundance to generate electricity and in combined heat and power systems. The gaseous biofuel methane is also used to generate electricity. 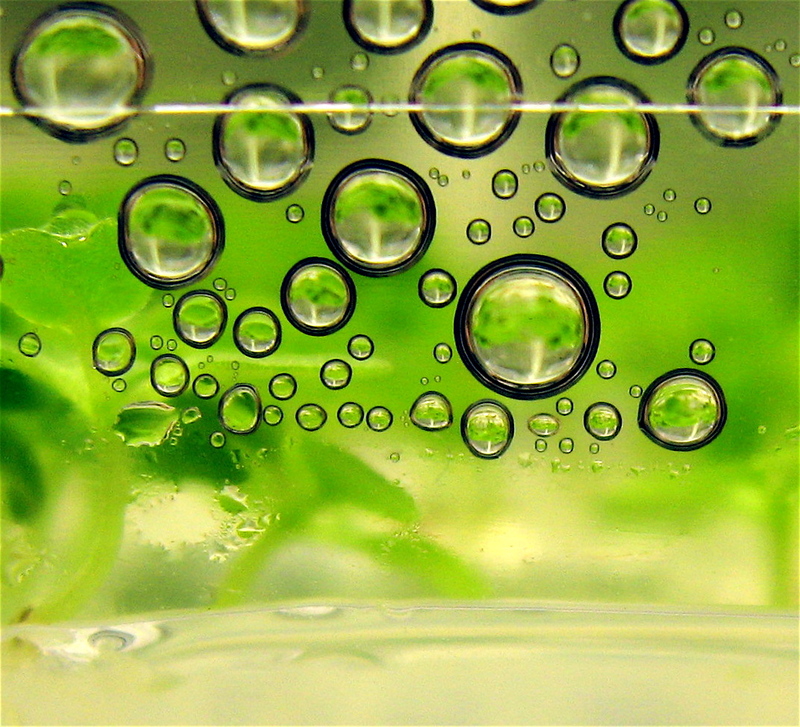 Liquid biofuels are used to replace fossil fuels petrol and diesel. Most of the energy consumed in used for vehicle transportation. Biomass such as wood and wood processing wastes are burned to produce heat in industries and used for electricity generation. Garbage is mostly used to produce electricity in waste-to-energy plants. The first energy source wood is widely utilized for industrial applications and domestic purposes. Although, both the renewable energy sources biomass and biofuel come from the same source, that is the natural organic products, they differ in the way they are used. Biomass is used to produce biofuel and can be converted into all major energy carriers such as electricity, heat, and transport fuels as well as a wide diversity of chemicals and materials that are produced from fossil fuels. Solid biofuels, principally biomass, have been used for thousands of years to provide heat and for cooking, and presently used for electricity generation and for heat and power systems. Sagar Khillar. "Difference Between Biofuel and Biomass." DifferenceBetween.net. 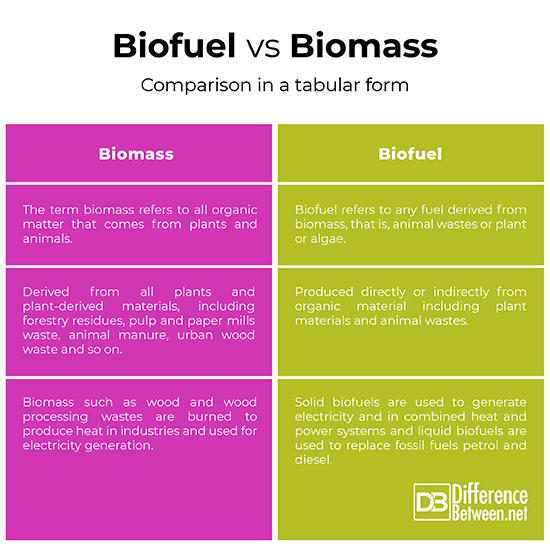 January 10, 2019 < http://www.differencebetween.net/science/difference-between-biofuel-and-biomass/ >.